MerchantCircle | Blog: Where is Bing Advertising? 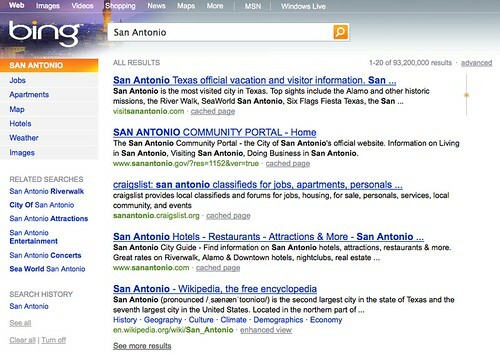 Microsoft is buying the ads through Google, but a quick click-through takes you to a search of "San Antonio" on Bing. 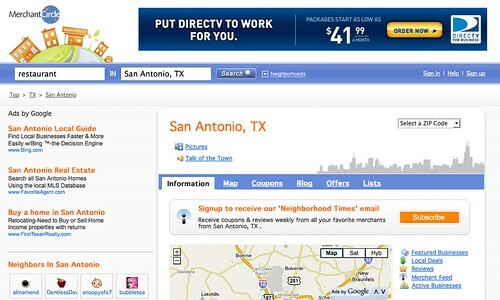 Could this be a play to gain traction amongst "local" search? I'm not sure, but we like the Bing search results we've seen so far. I'm much more favorably impressed with Bing than with the previous MSN search engine. Let's hope they are willing to keep investing time and money to improve it. The search engine field needs a few more good competitive players. I think Bing has a great opportunity to take a massive section of the market. Let's hope so, it certainly would give others the run for their money.